Time dedicated to museums in Venice is never enough. In the summer, or weekends, when visitors multiply, the risk of encountering long lines slowly cut back and give way to marvelous –and very diverse-museum sites on the lagoon island. This is only one of the many reasons to take advantage of the Museums under the moonlight 2018, which is returning this year until October. In particular, it’s the extraordinary opening of one of the symbolic areas of the city, Palazzo Ducale (The Doge’s Palace.) Visits available this summer until the 23rd. Last entrance at 10 p.m. every Friday and Saturday. Museums at moonlight is meant to create new opportunities to visit the enormous artistic patrimony of the city, favoring a more ample program, and the involvement of younger and public visitors that ordinarily would not be able to visit museums during normal opening hours. 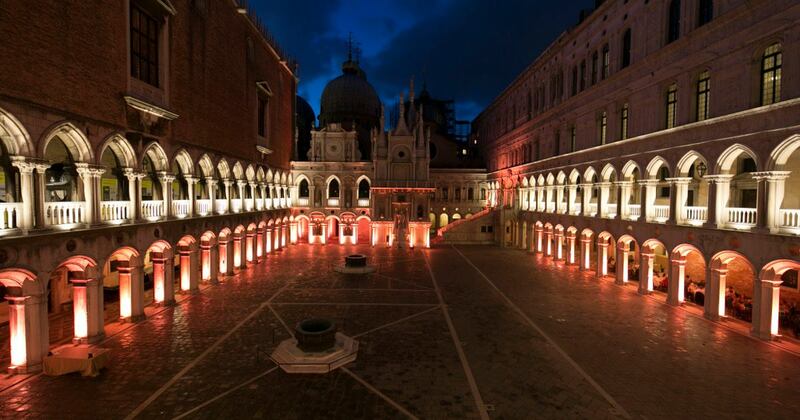 The opportunity to have a suggestive “nocturnal” itinerary in the areas and masterpieces in the Palace that is the “emblem” of the Serenissima will leave you without a doubt in awe. The occasion is a perfect way to uncover the rest of the city at night, between alleys and canals, in a dreamy and timeless atmosphere. During the night openings it is also possible to book a guided tour for adults and activities for families available in Italian, English, French, and German).